All DIMMs installed in the server must have identical capacities. In addition, all DIMMs associated with each CMP must have identical rank classifications. 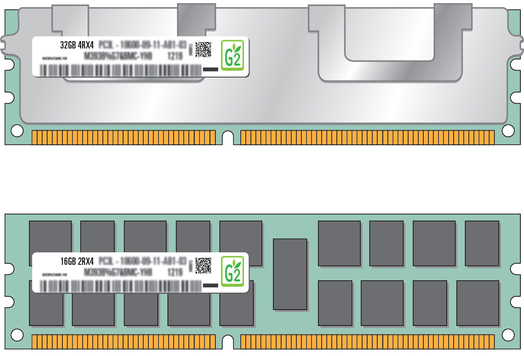 Each DIMM includes a printed label identifying its rank classification (examples below). Use these rank classification labels to identify the architecture of the DIMMs installed in the server, as well as any replacment or upgrade DIMMs you intend to install. Tip - Rank classification labels for installed DIMMs can be viewed with the memory risers installed in the server. To determine the rank classification of installed DIMMs, remove the server top cover and read the labels on the DIMMs. For top cover removal instructions, see Preparing for Service. The following table identifies the rank classification labels on supported DIMMs. 1Require System Firmware 8.2.1.b or later.